Sure to spark much debate, a denim-based Air Jordan 3 sample has surfaced. Denim has a place on sport-inspired sneakers, but the execution has been hit or miss over the years. That belief is evident with a couple of sneakers that have emerged from beneath the Nike umbrella this year. The Premium Air Force 1 Quickstrike that dropped in May is a classic example of denim done right. On the other hand, the "Denim" Air Max LeBron 8 Sample - ehh, not for me. Things certainly get a bit interesting when you tweak an iconic model like the Air Jordan 3. Can denim work on the shoe that MJ once took flight in? See for yourself below. 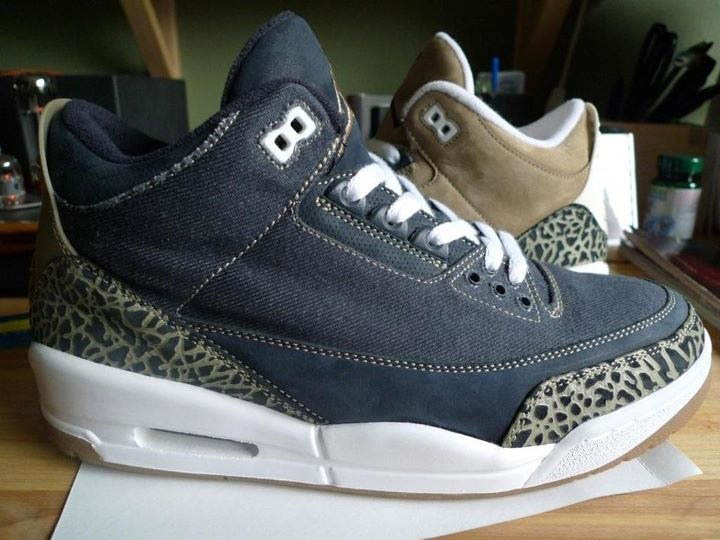 Pictured below is a "Denim" Air Jordan 3 sample that is part of a possibly already-scrapped pack. The shoe features gold Jumpman embroidery on the tongue, tan contrast stitching and white working the laces and upper lace eyelets. Tan and navy elephant print wraps around the toe and heel, while a white midsole and gum rubber outsole finish off the look below. This sample is sure to spark much debate, so let us know what side of the fence you fall on. Yay or nay for denim on the Air Jordan 3?